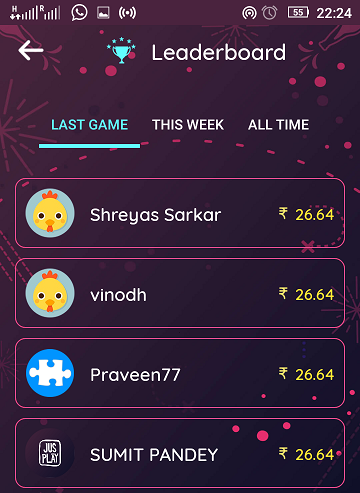 Recently I came across some quiz apps which pay money when we play and win quizzes. There can not be anything better than making money while doing favorite things. Quiz apps might be great way to enhance knowledge as well as to get entertained. Students who are preparing for various competitive exams like SSC, Railways, banking exams etc can test their General knowledge with quiz apps and get paid for their time. There are many quiz apps out there but not all are genuine. I have compiled a list of 5 quiz apps which really pay. Try to sign up these apps using the same mobile number you are registered with paytm. Why do Quiz Apps Pay Money to Users? They don’t give us money, we the users make money for them actually. You will notice a lot of ads while using these types of apps. They get paid for advertisements, in app purchases, subscriptions etc and out of their profit they pay us little back as reward. It’s a win-win situation for both. This was the first quiz app I tried and Got paid with in 24 hours. Money was instantly credited into my Paytm wallet. Winzo apps is one of the best and genuine quiz app. A challenge is given after every hour or half an hour. If you participate in a challenge and answer 4 very simple questions you get paid. Every question will have 4 options. When you sign up the app, you are asked to select topics you want to answers on such as bollywood, history etc. Special challenges given occasionally pay more. 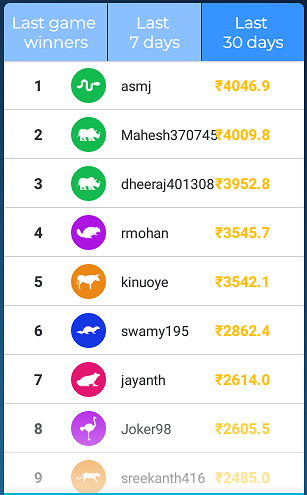 If you top the daily leaderboard, you get 500 Rupees which you can instantly transfer to your paytm wallet. 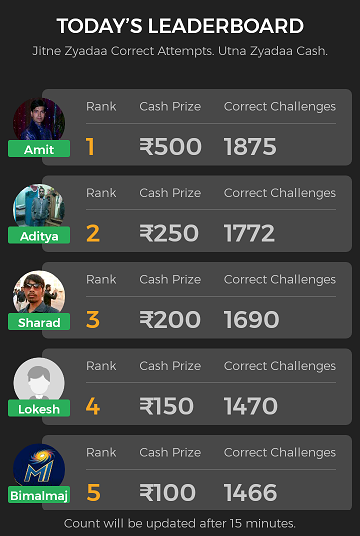 250 Rupees are given who secures second position of daily leaderboard. You get something everyday if you are in top 100 on leaderboard. More the quizes you complete correctly, better the rank you get. You don’t have to play game all day long if you are not doing it for leaderboard. Play only once during a challenge and Still you will make around 600 Every month. Upgrade to Winzo Gold to make much more money. How much you can earn from Winzo Gold app? I would say, If you buy a new phone on EMI and install the winzo app in it, this app alone will make enough to pay the premium every month on your behalf. As soon as you hit the “transfer to paytm” button, your money is sent to your paytm wallet. You can only redeem once in day. Loco Live Trivia & Quiz Game Show is entirely different from winzo app. 1:30 PM on weekdays and Every day at 10 PM, you are given 10 questions and if you answer each question correctly you surely win money. Winning amount may vary everyday because it depends on the no. of participant who gave all the answers correctly. One wrong answer and you get eliminated. If you have extra life, you can attempt again. Invite friends to earn extra life. You will have 10 seconds to answer each question. At 10 PM sharp, questions of quiz will start appearing on the screen one by one. Say 100000 participating are attempting quiz and total winning amount is kept 50000 Rupees . First question appears and say 60000 participants answer correctly. Other 40000 participant will be eliminated until they have extra life. Suppose at the end, they only left with 100 participants answered all the 10 questions correctly. The winning amount 50000 Rupees will be distributed equally among all the 100 winners. 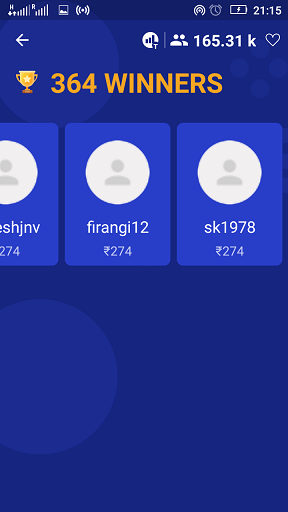 So each winner in this example win 500 Rupees. In this way the prize amount vary with every contest. Payouts are made next morning of the game. Qureka hosts several quiz games every day such as at 8:30PM you can play for INR 50000, Mega Quiz worth INR 200000 at the end of the month and several mini quizzes everyday to get an extra life or 1000 Rupees. Rules are almost same as Loco. You get 10 questions to answer, 3 options for every question and 10 seconds to answer each question. Total prize money will be distributed equally among all those who get all the 10 questions right. Top 3 fastest quiz takers will get additional 1000 Rupees. Mini Quizzes have only 3 questions. MobShow is another good live quiz game show app like Loco app. Quizzes appears at 7:30PM and 9:30PM everyday. You are supposed to answer 10 questions correctly to get a prize. Questions are asked from general knowledge, sports, bollywood, movies, music, history hollywood, comics and mythology. Every question have 3 options and you have to answer a question with in 10 seconds. Show times are fixed, you just have to be there on right time and start answering. They distribute 55000 Rupees everyday. Your winning amount will be delivered in your paytm account with in a week. Very similar to Loco app, you compete in a live quiz with thousands of other players to win money in BrainBaazi. You get 11 questions to answer and 10 seconds for each question. Each question will have 3 options. One wrong answer and you are out of the game until you have an extra life. You can only use 1 life in one quiz. Answer all the 11 questions correctly and you certainly win real cash. 10 Minutes before the quiz starts, BrainBaazi releases the cheat code which if you can remember during the game can be a great help in winning the prize money. Jusplay is live trivia show where 11 questions are asked at 7:30 PM and you get 10 seconds of time to answer for each question. You are allowed to use 2 lifelines per show. If you have a lifeline you can stay in the game even after you give wrong answer to a question. You can invite your friend to earn a lifeline or purchase lifeline in the app. The prize money is divided equally among all the winners at the end of the quiz. Sometime these apps stuck even in 4G network. I would suggest you to use text only mode. These apps only pay via Paytm which is an Indian wallet so I think these are not available outside India. 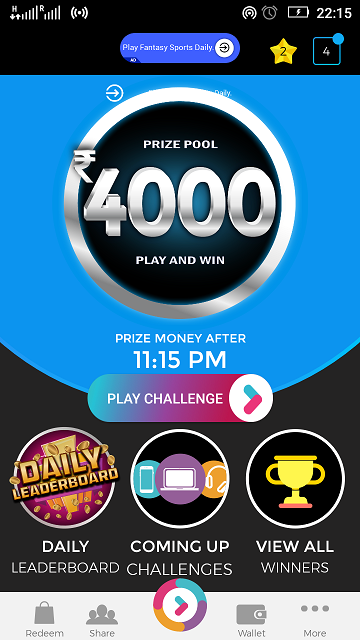 If you are only looking for quiz and trivia apps and not want to do it for money then I would suggest you to download apps like Jeopardy-world tour, Trivia 360 and Quizup etc. They don’t pay money but you will have a lot of things to learn. If you are not comfortable with these apps, no worries. There are other 10 ways to make money online without investment. Share this article among your friends if you find it useful. After graduating from university with a degree in Printing Technology, Sudhir Sheoran quickly got his feet wet in the blogging world. He decided to take his passion to the next level and founded INCOMOPEDIA. He loves writing about Printing Industry, Blogging, Make Money Online Opportunities and Everything Else that fascinates him. 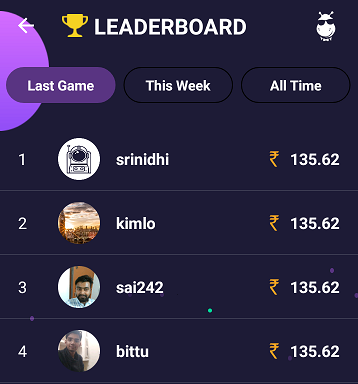 Hi Sudhir Sheoran, such an amazing list of 5 quiz apps to earn money online. This is very interesting to the people who are so smart and genius. Thanks for sharing this list with us. Keep sharing. Looking for more valuable and interesting post from you. A great article again! I have been following since June and now I gotta admit your info is quite useful and also I am going to follow your posts everyday. Hope you keep publishing these masterpieces.